The name "DVD Slideshow Builder Deluxe" is something of a misnomer. Wondershare's $60 application does, in fact, help you build slideshows. And, yes, you can burn those slideshows to DVDs that you can play back on your TV. On top of that, however, you can save the slideshows as video files that are compatible with mobile devices and Web services, making DVD Slideshow Builder Deluxe a whole lot more useful than its name implies. DVD Slideshow Builder Deluxe's neatly organized layout makes it easy to switch between organizing photos, adding themes to a slideshow, and publishing the results. When you first launch DVD Slideshow Builder Deluxe, it can seem a bit overwhelming, with its various windows and tabs for organizing, personalizing, and creating slideshows. But taking the time to read through Wondershare's brief getting-started guide (and I do mean brief--it's only four steps long) is worthwhile. You'll be adding files and creating slideshows before you know it. After you add photos, you can easily rearrange and delete them as necessary, as well as tweak them using the built-in (but basic) editing tools. Once your photos are set, you can apply a style and other customizations to the slideshow. This is where I found some of the features to be confusing at times, but that's largely because the program offers so many options. For instance, I clicked on a theme, expecting the application to apply that theme to my slideshow, but instead it merely presented more options for that theme. This software can be a bit much if you're looking to create just a basic slideshow, but if you want to put the time and effort into using DVD Slideshow Builder Deluxe, you'll find plenty of features here. You can add music, clip art, credits, and other elements. Microsoft's free Windows Movie Maker, included with most Windows PCs, provides some of the same features. In Windows Movie Maker, you can import photos, add music, set transitions, and more, but you don't get as many advanced options there as you do in Wondershare's application. Microsoft's program is a bit simpler to use than DVD Slideshow Builder Deluxe, but the results look more basic, too. And although Windows Movie Maker lets you publish your video slideshows to the Web or share them via email, it doesn't allow you to burn them to a DVD unless you have Windows DVD Maker. One advantage of the free Windows Movie Maker is that it includes some basic video-editing features, whereas Wondershare's program only creates video slideshows. The fact that you can easily create a video file for sharing on YouTube or an iPad is a nice touch, and one that makes Wondershare's DVD Slideshow Builder Deluxe infinitely more useful than a tool that just burns the end result to a disc. Nevertheless, DVD Slideshow Builder Deluxe is a one-trick pony. It handles that trick very well--if you want to create a sophisticated video slideshow, you'll be pleased with this application. But if you want to do anything more, you'll be at a loss. 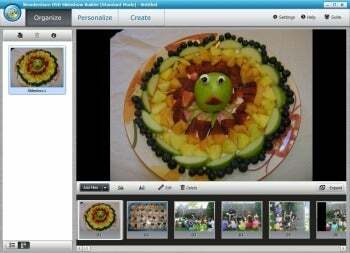 You can add pizzazz to slideshows, and make versions for mobile devices, with Wondershare DVD Slideshow Builder Deluxe.